There is no shortage of admiring descriptors for Coral Baby penstemon. Let’s consider stunning, eye-catching, beautiful, dazzling, lovely, gorgeous and striking to name a few. They all apply to this delightful penstemon that is eye-candy to gardeners everywhere. Coral Baby has put on a wonderful display for the past several years at Kendrick Lake Garden in Lakewood, CO. Camera shutters have been in action capturing the WOW! 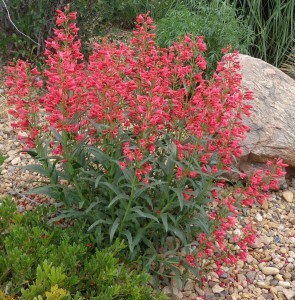 factor of this ultra-pretty penstemon with upright spikes of coral pink flowers. Coral Baby appeared as a seedling from the cross between ‘Rondo’ hybrid barbatus penstemon and ‘Schooley’s Coral’ barbatus penstemon and was brought to Plant Select® by Kelly Grummons of Timberline Gardens. It is relatively compact, growing about 15 inches high and 12 inches wide. The bright green foliage is handsome and sets off the intensely saturated color of the flowers that appear from late May into July. It is long lived for a Penstemon, and is undemanding if planted in full sun and well-drained soil. In addition to just looking lovely, the tubular flowers of Coral Baby will attract bees, butterflies, hummingbirds and hawk moths to your garden. The tidy form makes this a perfect plant for perennial borders and rock gardens. It plays nicely with other xeric perennials, grasses and shrubs and deserves a place in your garden, especially if you enjoy the power of pretty.